When people say they have a budding business, you assume the business is new. But when Janette Gallagher and Lois Moll talk about their budding business, Palisades Planters, the phrase is meant quite literally. 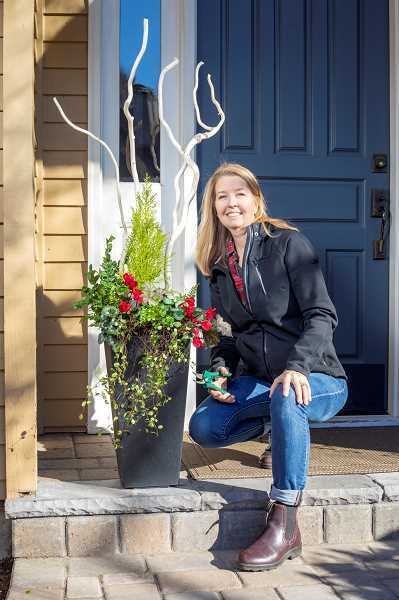 The new business brings buds and blossoms to homes throughout the Portland metro area, with a simple goal: to ensure every visitor to a client's home is greeted with a green and colorful 'Hello!" They believe entrances, patios and decks deserve to be inviting and beautiful. "Flowers just lift you," says Moll. "Many working people don't have the time or green thumb to create this point of beauty." The Lake Oswego women both have existing businesses involving horticulture — Gallagher founded Gallagher Landscape Design about 10 years ago, while Moll earned her floral design certification at the Floral Design Institute of Portland and then founded Sunnyhill Blooms in 2018. Palisades Planters, they say, is a chance for them to work together. Gallagher's lifelong love of the outdoors, horticulture and design began as a young girl growing up on a farm in New Jersey. Her mother, a garden club member for more than 45 years, encouraged her early on to garden. "She has been a tremendous influence on my love of landscapes and design," Gallagher writes on her website, www.gallagherlandscapedesign.com. Gallagher earned degrees in art and communications arts in college, and then pursued a career in advertising. "After moving many times and finally settling in Portland, I shifted careers and combined my love of design with the outdoors and focused on landscape design," she says. "My husband and two children moan every Mother's Day as I never want to go to brunch. My family day usually involves compost and the garden." She studied horticulture and landscape design at Clackamas Community College and Portland Community College's Rock Creek campus and has served as president and vice president of the Association of Professional Landscape Designers, Association of Northwest Landscape Designers and the Hardy Plant Society. Moll, a graduate of Lake Oswego High, earned psychology and rhetoric and communication degrees from the University of Oregon. She started her career as a housewares and crystal buyer for Meier & Frank, then worked as a manufacturer's representative for Cuisinart. She further honed her entrepreneurial skills through the purchase and management of a Dream Dinners franchise. Now, she says, applying her business acumen to the world of flowers brings her a lot of joy. The women have been friends for decades; they met through their children, who attended Palisades Elementary School and then continued through the Lake Oswego school system. "Lois and I have this great camaraderie," says Gallagher. "We wanted to work together and dreamed up this planter business. It's been so much fun!" "We originally thought we would just do planters in Lake Oswego," says Moll. "But the word kept spreading and now we have clients in Hillsboro, Portland Heights, Sherwood, Southwest Portland and Bull Mountain, so we go everywhere." 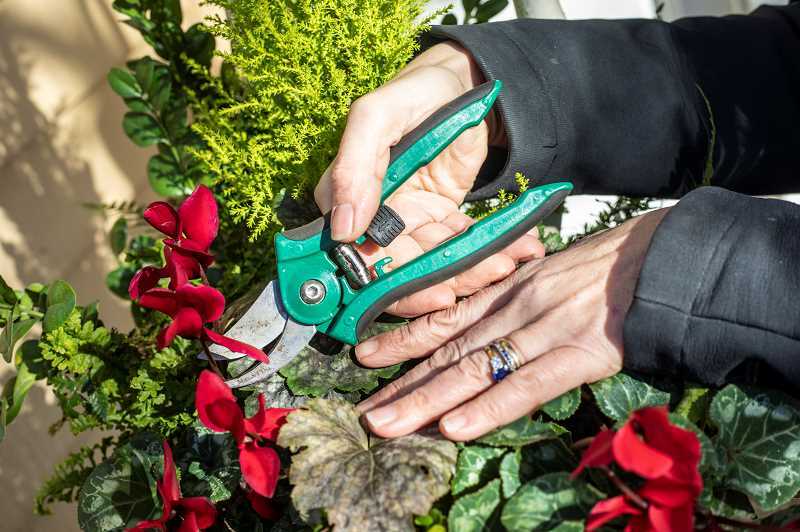 She says it takes time to select plants that will thrive together, ensure the soil in the pots is amended correctly and fertilize the planters as needed. "We do all that," she says. "All they have to do is water it." When clients sign up for Palisades Planters' service, they determine how many planters they wish. "We use what we call our 'little black dress,'" says Moll. "It's a black planter that goes with every home exterior." Palisades Planters asks for a minimum order of two outdoor seasonal planters during a 12-month period, with options for spring, summer, autumn and holiday. The women are preparing for the spring planting now. "You should see when we are preparing to change out the planters," Gallagher says. "The whole driveway is filled with flats of plants." To learn more about Palisades Planters or Sunnyhill Blooms, visit www.sunnyhillblooms.com. To learn more about Gallagher Landscape Design, visit www.gallagherlandscapedesign.com or call Moll at 503-577-8444 or Gallagher at 503-381-3445.